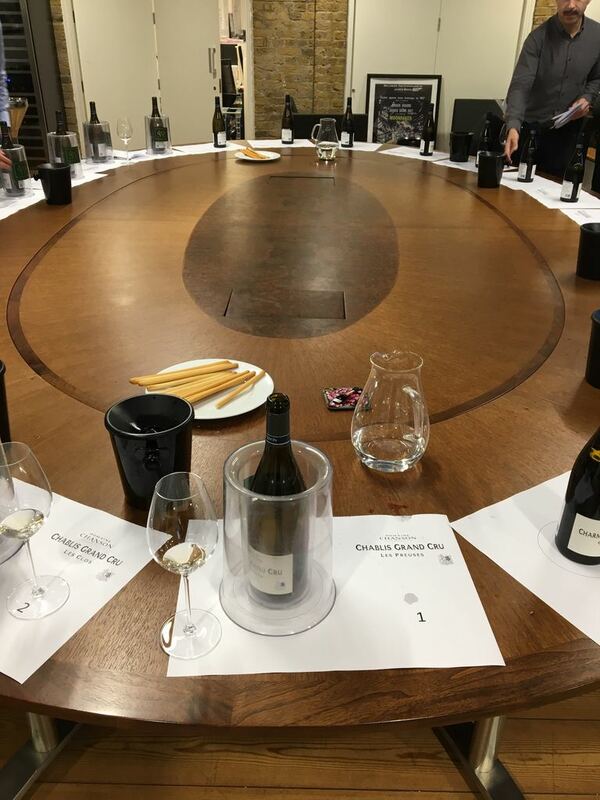 Earlier this week we had the pleasure of attending the Domaine Chanson Père & Fils En Primeur 2017 Tasting hosted by Managing Director, Vincent Avenel. Domaine Chanson is one of the oldest, great Beaunoise Négociant, founded in 1750. Perhaps surprisingly then, with Jean-Pierre Confuron at the helm, they employ very modern winemaking techniques and are at the forefront of technology. They produce clean, fresh wines with a varietal purity of flavour and fine structure. One of their most impressive feats is the development of their own technology which supposedly allows the grapes to be cooled individually, intact and on stems (by cooling the air around the grapes), essentially enabling them to undergo pre-fermentation cold maceration and carbonic maceration simultaneously. Possibly the only winery in the world to do so. This is not only a stylistic decision but, coincidentally or not, a smart move in terms of preparing for the future. Carbonic Maceration and Cold Soaking are both means of enhancing fresh varietal flavours while retaining acidity, and without developing coarse tannins – qualities for which much of Burgundy is renowned and risks being lost with the climate warming at such an alarming rate. So, whilst many Vignerons are holed up in candle-lit cellars, scratching their heads with only a baguette and a hunk of Gruyère for company and pretending not to panic (how I like to imagine it anyway)– It would seem that Chanson is already ahead of the game in future proofing. Further to this, as Vincent explained to me, they are also reining in their use of new oak, even in the Beaune, as another method in the fight against the rising temperatures (it’s also very In Vogue at the moment). I’m not quite sure how this works -the only reasoning that I could come up with would be perhaps the lessening of the sweet spot effect of oak influence due to the increase in perceived sweetness, higher alcohol and riper tannins, or maybe now the new oak needs too long a time to assimilate OR perhaps this is some more new super scientific top secret knowledge that Domaine Chanson are keeping close to their chest! Whatever the reasoning, it was evident in the wines, as was a noticeably early openness for many. Aside from the Grand Cru Chablis which was shut with lock and key, even towards the very top end, many were approachable (to varying degrees) and could be drunk in the not too distant future (not to say they should be of course). Starting with the whites, the Meursaults were showing beautifully, in particular The Perrières; structurally perfect, with an intense and precise minerality softened by only a suggestion of sweet new oak; not overpowering and already in balance with the wines waxy citrus peel aromas and vibrant floral notes. The Chassagne-Montrachet, naturally more pronounced, displayed sweet almond, under-ripe peach and honeysuckle although was quite bitter on the finish (hopefully this will dissipate over time). Another highlight was the Puligny-Montrachet Les Folatières which, although very closed, was just hinting at the fruit to come and upon opening up, the vanilla gave way to subtle smoke, cloves and a wet stone minerality that stayed on the palate for a lengthy finish. Apart from the Beaune Grève, which was unpleasantly reductive, giving off eggy wafts which refused to budge, the reds were largely lean, bright and beautifully balanced. The Gevrey-Chambertin La Perrières was a brooding mesh of red and black bramble fruits, sour cherry with a weighty mouthfeel and long developing finish. The Beane Teurons, a personal favourite, was a fruit forward delicacy; earthy, spicy, notes of cinnamon and kirsch, exhibiting great depth and weight to finish. The Clos de Vougeot; intense in colour yet lighter in weight showed plenty of dark ­red fruit developing into a wonderfully savoury palate of earthy notes, wet leaves with a green herbaceous edge. A classy finish! All of these wines will benefit from at least five years in bottle and I very much look forward to tasting them then – and to finding out what the geeks at Chanson will be doing by then!